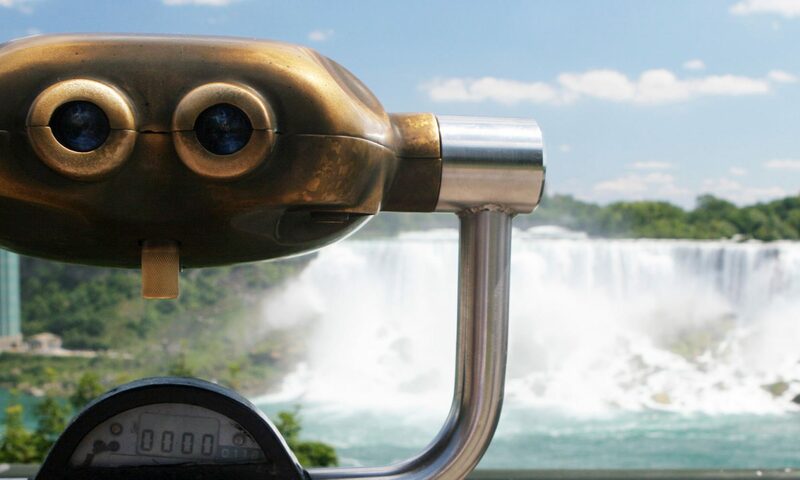 On August 12th 1938, the first meeting of the newly formed Niagara Falls Bridge Commission took place in Niagara Falls, New York. Fred M. Krull, Will A. Cannon and Samuel S. Johnson were appointed by New York State Governor, Herbert Lehman to represent the State of New York. Canadian members appointed to this board were serving members of the Niagara Parks Commission. They were T. B. McQueen, Archie Hanes and C. Ellison Kaumeyer and would represent the Province of Ontario. With joint Government of Ontario/New York approval, the Niagara Falls Bridge Commission became responsible for the administration and maintenance of all the international bridges crossing the Niagara River. Soon after, the Niagara Falls Bridge Commission formed a plan to finance, construct and operate new bridge over the Niagara Gorge to replace the Honeymoon Bridge. The new bridge was to be named the “Rainbow Bridge”. On November 15th 1938, Samuel Johnson, vice-chairman of the Niagara Falls Bridge Commission announced that Edward P. Lupfer Inc., an engineering firm in Buffalo, New York would design the new bridge. Mr. Shortridge Hardesty of the firm Waddell & Hardesty would be appointed consulting engineer. In 1939 King George VI and Queen Elizabeth visited Niagara Falls and dedicated the site of the Rainbow Bridge. A monument commemorating this occasion was erected on the Canadian shore. On May 4th 1940, construction on the Rainbow Bridge began approximately 550 feet (168m) north of the previous Honeymoon Bridge. At this point the Rainbow Bridge was 1,000 feet (305m) north of the American Falls. The Niagara Gorge is 200 feet (60m) deep and approximately 1,000 feet (305m) wide. The water current under this bridge averages 26-30 miles per hour and the water depth is 175 feet (53m). In one minute it is estimated that 6,000,000,000 pounds of water cross under the Rainbow Bridge. The span of this bridge is 950 feet (289.5m). Each of the main arch abutments are located 50 feet (15m) from the rivers edge and 50 feet (15m) above the surface of the water. The abutments and the approach spans rest on solid rock on the sides of the gorge and are high enough to avoid a similar catastrophe that had occurred to the Honeymoon Bridge. The main span of this hinge consisted of two steel box girder ribs spaced 56 feet (17m) apart. Each arch is made up of 24 sections, 12 feet (4m) high and each weighing 49 to 75 tons. Approximately 3500 tons of steel were used in the two ribs and 2,000 additional tons of steel in the superstructure and decking. The two ribs are braced together with steel members for rigidity and to resist wind pressures. Steel spandrel columns, which rest on the arch ribs, support the steel floor beams, the stringers and the concrete deck of the roadway above. With all the sections in place, a closing section of steel measuring approximately 11 inches was used to join the 475 foot (145m) sections extending from each shore. This was later replaced with a permanent piece designed for temperature expansion and contraction. Also, it was machined to a tolerance of within one-one-hundredth (1/100th) of an inch. With this piece in place, the arch became self supporting upon its abutments. The deck of this bridge is 202 feet (61.5m) above the water surface and the approaches measure 1,450 feet (442m) long. There are two, 22 feet (7m) wide roadways separated by a four foot (1.2m) wide median with a ten foot (3m) wide sidewalk along the south side of the bridge facing the Falls. During construction, life nets placed under the bridge caught those workers who accidentally fell from the structure so that there was no loss of life. The official opening of the Rainbow Bridge took place on November 1st 1941.